Biyamiti bushveld camp is situated in the far south of the Kruger National Park, on the tree lined river bank of the Mbiyamiti river. "Biyamiti" is a word in the Shangaan language, which means "a fence of sharp wooden spears". 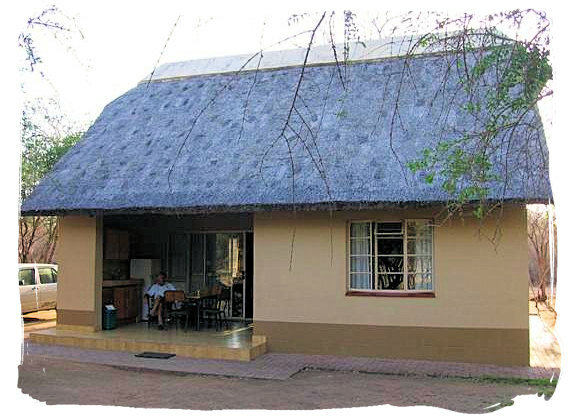 Built in 1991, it is the most recent of the bushveld camps in the Kruger Park. 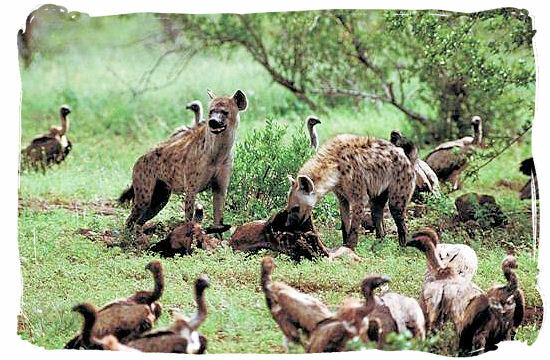 Nestling amidst Delagoa thickets, the camp is situated about 5km from the crocodile river, the southern boundary of the Park. In line with the relatively new concept of small and more luxurious bushveld camps, this camp is intimate and secluded, with a unique atmosphere and superb game viewing. Only residents are allowed in the camp and on the access roads to the camp, offering them the opportunity to enjoy their African safari and other bushveld experiences in complete privacy. Lying close to the old trade routes where Ox-wagons once cut their way through the bushveld on their way to the coast, The bushveld camp also has some historical significance. One can still sense the fearlessness and daring of the transport riders, cutting their way through the African wilderness with their Ox-wagons, fighting disease, obstacles and elements, to transport goods between the interior and the coast. The camp is situated within the typical fairly dense mixed woodland of the area (Thorn Thickets), amidst huge Wild Fig and Jackal Berry trees, offering a vast array of flora and fauna. The riverine vegetation around the region and along the Crocodile river includes trees such as Tamboti, Knob Thorn, Magic Guarri, Green Thorn, Sausage Tree and Marula. Located close to the Crocodile Bridge gate, the bushveld camp is ideal for those who want to spend just one day in a bushveld camp in the Kruger National Park. The Big 5 are present in the area, including the Black Rhino. Other animals to be spotted in the region are Giraffe, Kudu, Duiker, Impala, Steenbok, Zebra, Hippopotamus and Hyena amongst others. 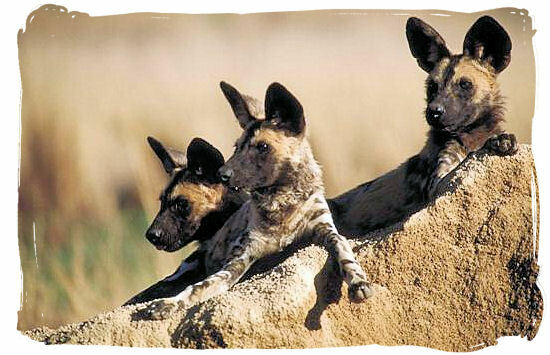 The chance of seeing the elusive Cheetah or a pack of Wild dogs is excellent. 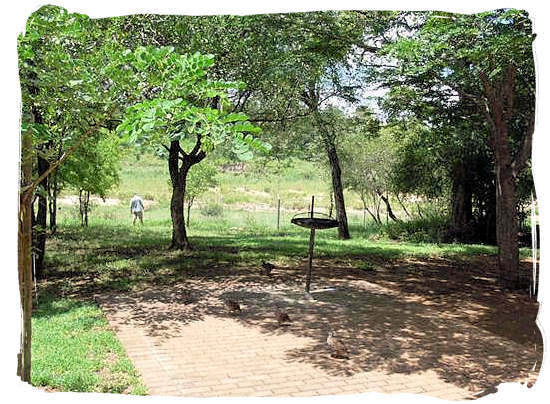 The well foliaged camps in the Kruger National Park in general attract a multitude of birds. 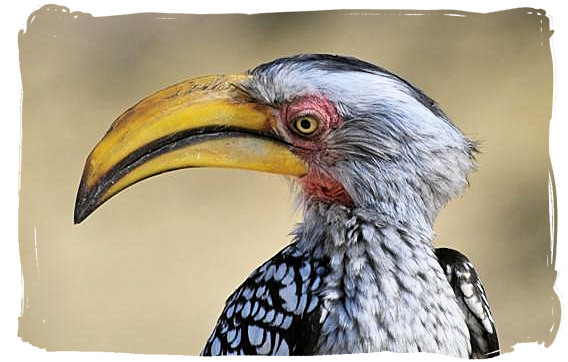 The Park's five bushveld camps in particular offer superb birding opportunities. 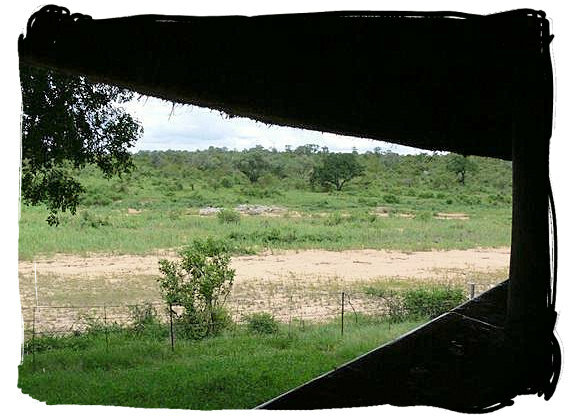 There is a hide at the camp overlooking a water hole, from which bird watching can be very rewarding. 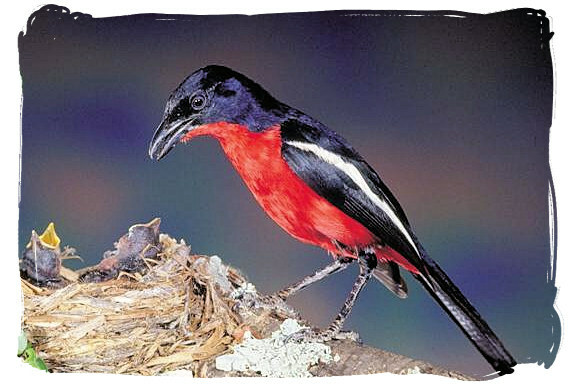 Species one should look for around this camp are the African Barred Owlet, Retz's (Red-billed) Helmet Shrike, the Plum-coloured Starling, the Purple Roller, and the Red-backed Shrike. Go to SANParks.org to view a map of the Kruger National park showing the location of Biyamiti bushveld camp, then click on the map to enlarge. Go to SANParks.org to view a map of the Biyamiti bushveld camp showing the lay out of the camp itself, then click on the map to enlarge. The bushveld camps in the Kruger National Park have been kept small en intimate, offering guests a private and exclusive bushveld experience. Facilities are limited to those necessary for a small group of people. These include Information and Reception, Public telephones, and a Mini-shop stocking basic items such as firewood, ice and phone cards, but no food. 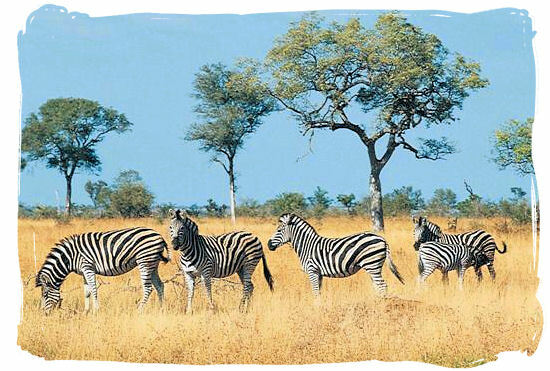 Major camp facilities are available at Lower Sabie, the nearest main rest camp. Mini Shop at reception stocks basic items such as firewood, ice and phone cards. There are no foodstuffs such as meat available. Each accommodation unit has it's own “braai” (barbecue) facilities. Like all the bushveld camps in the Kruger National Park, Biyamiti bushveld camp offers luxurious, well equipped accommodation in the form 15 cosy family cottages. These are spread out in a long well spaced line, curving along with the river bank. Together they can accommodate up to 70 people. There are self catering and barbecue facilities at each cottage, enhancing the atmosphere of intimacy and privacy in the camp. 10 x 2-Bedroom units. Both bedrooms have ceiling fans; one has 3 single beds, and the other 2 single beds. One bedroom has a bathroom en-suite (bath, toilet, and washbasin) and there is a separate toilet, shower and washbasin. The kitchen has a gas stove (with oven), fridge/freezer combination, sink, cooking utensils, crockery and cutlery. An open veranda serves as both dining room and lounge. 5 x 1-Bedroom units. The bedroom contains two single beds and has a ceiling fan. There are two bench-beds in the living room with a ceiling fan. The bathroom has a bath, shower, toilet and washbasin and inter-leading doors to the bedroom and living room. Meals can be taken on the open veranda. The kitchen has a two-plate electric stove (without oven), sink, fridge / freezer combination, cooking utensils, crockery and cutlery. All lodging units are serviced daily and supplied with bedding, towels and soap. The region around the bushveld camp is excellent for game viewing with the presence of the Big 5 and in particular the black Rhino. 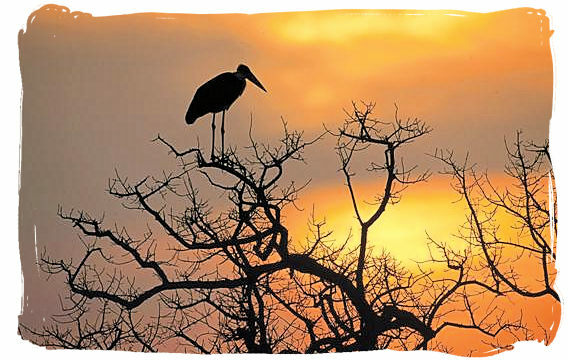 Enjoy an exclusive night drive and take part in the nocturnal activities of the Bushveld's nightlife. Explore the bush on a guided bushwalk accompanied by well trained and armed game rangers. Track Rhino, Elephant and Lion on foot, learn and observe fascinating facts about Africa's wildlife. 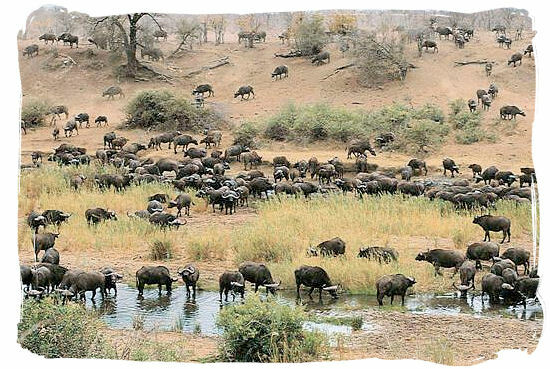 Biyamiti’s guests may also take part in the activities available at Lower Sabie, the nearest main rest camp. The closest airport to the camp is Kruger Mpumalanga International Airport (KMIA) which is situated between Nelspruit and White River, approximately 25km from Nelspruit and about 36km from the Kruger National Park's Malelane gate, which is nearest to Biyamiti. There are daily scheduled flights between KMIA and OR Tambo International Airport in Johannesburg, with less frequent flights from Cape Town and Durban International Airports respectively. From Malelane gate to the bushveld camp is a distance of 41km. Considering the speed limit of 50km/hr on the main roads inside the Park, allow about one and a half hour for the drive to the camp. Take the N4 to Nelspruit and then continue with the N4 to Malelane. Turn left at the Kruger National Park sign just outside Malelane and head for the gate. Travelling from Johannesburg or Pretoria, allow between 4 to 5 hours for the trip to the Malelane gate. The camp is about 41km away from the gate. Considering the speed limit of 50km/hr on the main roads inside the Park, one should allow about one and a half hour for the drive to the camp, however if you want to enjoy the game viewing possibilities give yourself more time. 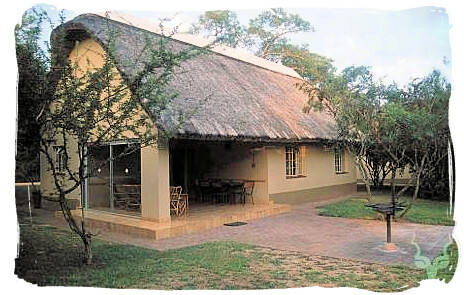 Go to SANParks.org to view a monthly calendar with accommodation availability details of Biyamiti camp. You will then be able to view the accommodation availability page of the South African National Parks (SANparks) website, for Kruger National Park’s Biyamiti bushveld camp. Go to SANParks.org to book your reservation for the Biyamiti bushveld camp in the Kruger National Park on the official reservations page of the South African National Park's website. Go to SANParks.org to view the tariffs applicable for the Biyamiti bushveld camp on the official tariff page of the South African National Parks (SANparks) website.